As a successful restaurateur and chef, Tim Love knows what it takes to grow a successful business, with four popular restaurants under his belt and a spot on Restaurant Startup, a CNBC television show where budding restaurant owners pitch their ideas in hopes of investment funds and guidance from top celebrity restaurateurs. At SXSW 2016, I had the opportunity to speak with Tim Love as he shared his advice for restaurant and other small business owners. I won’t give away all the details. To hear Tim’s advice, including advice for restaurant owners who are just starting their business, you’ll have to click play below. Put aces in their places and you’ll make money. What Tim is referring to is the importance of hiring people who are better than you to help grow your business to the next level. This advice is echoed by other successful entrepreneurs who say you should hire smarter than you are and aim to be the dumbest person in the room. Obviously, Tim has been successful at putting aces in their places. With a packed schedule and so many business ventures, Tim has had to develop the right teams at each of his restaurants to ensure their success. So how can a small business owner do the same?
. 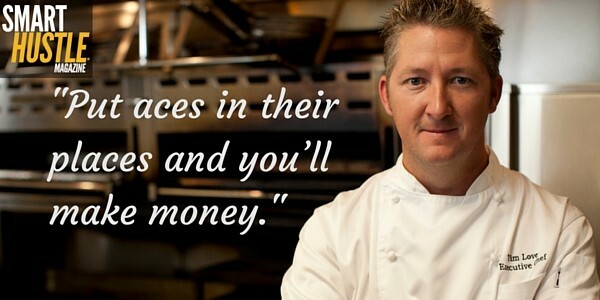 @cheftimlove knows #business. Check out his #bizadvice in this #SXSW2016 interview. There is a certain humbling aspect of hiring people who are better than you, and it starts with a new assessment of yourself – namely that you don’t know it all, even though this is your business. Accepting that fact is an important first step. Here we are communicating the importance of finding workers with the right mindset. An employee can do the job and even do it well. However, an entrepreneur is a thinker that will rise above the average worker bee. They will help solve problems before they come up and innovate to drive growth. Many have made the case that experience is overrated. Instead of wasting the full interview time going over past experiences, ask the right kind of questions that get at a potential hire’s ambition and drive. Leave some time for the candidates to “interview” you too. The type of questions they ask will give you great insight into the sort of worker they will be. When it’s time to make a hiring decision, don’t forget the importance of attitude and potential in your chosen candidate. Do they have a positive attitude? Do their personality traits match what you need in your business? Do their own beliefs align with the company culture? Given the right training, could you see this person grow successfully into their role? Once the right employees are hired, step back and let them do their job! Micromanagers are stuck on the idea that only they can do things the ‘right’ way. This discourages moral and personal development. All employees, new and old hires alike, should be encouraged to grow in their roles and their skills. You may consider things like internal training or a side fund for skill development programs, but the most important aspect is to be supportive and respectful. Tim Love knows that “putting aces in their places” is the key to growing your business to the next level. Follow these tips and you’ll be able to build the right team that will help you get there.